Family Orange River Rafting Adventure. It is difficult to decide what to do as a family every year. We stay in different towns and cannot always make time to spend together. My daughter a few months back had a class outing where they all went zip-lining in Constantia with SA Forest Adventures. She overheard one of the guides mention that they were taking a family Orange river rafting soon. Between her raving about how amazing Cape Town ziplines was and her begging me to go Orange river rafting. I started to think about suggesting the family go on a rafting trip. Camping under the stars, while spending our nights huddled around a camp fire and competing to catch the biggest fish in the day. That sounded like bliss! Some of us are not particular water babies, where both my brothers have a deep love for water sport. I did some research of course and found SA Forest Adventures to be the company to not only respond the quickest, but they were the most forthcoming with information and friendly assistance. My mind was made up. I managed to secure a booking after a mild debate between the family: My sister was worried about our parents both in their 60’s, and her own son which just turn nine. Looking back I smile because it is difficult to tell who enjoyed it more, the younger or older family members. The entire experience was out of this world! In some areas the water level was turbulent but not so that it was dangerous. With that said it was never boring. If you didn’t want to paddle down a moody stretch of water called ‘Big Bunny’ you could get out and walk along the side watching as the rest of us screamed in delight. Not once can I say that the Orange river rafting was tedious, some areas were more placid but there the wildlife was utterly captivating. We saw birds of prey swoop down and catch fish meters for our rafts as we floated down the river. There were a number of otters that dashed and dived on the edges of the river as we drifted along. We even saw small monkeys gallivanting in the tree tops completely oblivious to our large group passing within reach of them. The entire trip form pitching up tents, to fishing, meals and transport – everything was efficient and one could easily distinguish that the company had done this more times than they could count. This however did not take away from their enthusiasms and eagerness to assist. With regards to rafting, we were seated two per raft, which made it all the more interesting. We were constantly competing on who could paddle to the front, during the few days we also switched partners which I know was the best bonding session my son and husband had in months. In this day and age it is sometimes difficult to catch up and just talk while seated in close proximity. It warmed my heart to see them laugh and splash each other while enjoying the comfortable row down the river. It is valuable time that I know each of us will treasure for always. The small chats, the laughs and over all the entire experience. I want to thank you SA FOREST ADVENTURES, for taking us on a trip of a life time! Thank you for your efforts, for the photos, the delicious meals that had my daughter going back for seconds. Already my children are speaking about the next Orange River Rafting trip, this I see will become an annual ritual in our family. Recently my husband convince me to join him for a trip rafting down the Orange River near the town of Onseepkans on the Namibian border close to Pofadder. The reason why we selected to raft the Orange River Rafting Gorge section near Onseepkans was that we have rafted the Vioolsdrift section. It was disappointing with how commercialized the whole experience was. We had 4 other rafting companies with us on the same stretch of river. It did not feel remote at all. 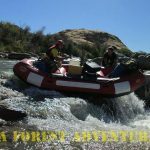 As the Owner of Sa Forest Adventures explained to us – our experience with them would be similar to an exploration experience vs the commercial rafting experience. He was spot on! Although my husband and I are both somewhat adventurous I sincerely did not know what to expect from our Orange River Rafting holiday. We have traveled quiet extensively, but I must say without hesitation this Orange River Rafting trip was by far the most memorable of all our excursions. It completely exceeded our expectations! Normally on trips like this you often experience hiccups with regards to bookings, logistics etc, however the process was quick, effective and being a bit of a control freak I was delighted when the information and details were swiftly emailed through. We were kept in the loop about departure times, what needed to be brought along and what the company supplied ect. Our transfer to Onseepkans for the Orange River was in a spacious sprinter 13 seater bus, with aircon and enjoyably there was a constant flow of music which kept the small group in jovial spirits. The transport was an additional cost but worth the price for not driving from Cape Town and back. Through-out the trip I must admit that I was pleasantly surprised at the professionalism and friendliness of the guides. They were extremely knowledgeable about the terrain and the rafting in general. They taught us the necessary signals when in various situations on the water and also took time to ensure proper safety was set up for each rapid. The food that was served on this rafting trip was phenomenal! I mean out of this world! The rafting takes place on one of the most remote stretches of rivers. So we did not expect such a high standard in food. From the breakfasts, to snacks for lunch and dinners. It is difficult to distinguish a favorite. All the dishes were prepared skilfully over the crackling fire. There was an array of fruits, teas, coffees and yogurts also served some mornings when a warm breakfast wasn’t served. I didn’t dream that these meals would surpass even some hotels we have stayed at before. But I am letting the delicious food side track me. On this trip it was as if my eyes opened to the remarkable beauty of nature for the first time. A kaleidoscope of orange, reds, and yellows painting the canvas in the sky every evening upon its descent. I know, I have left the best for last. The actual experience of the trip was surreal for the lack of a better word. From start to the finish, the raw beauty of the canyons we rafted past had me in awe – the scenery was breath-taking. With each paddle new wildlife, and knew elements of nature were exposed to us. It was as if the crew had managed to guide us into one of nature’s most secretive locations in Africa, which had been yielded to only the bare minimal human contact. The Orange River Gorge was the Highlight of our 4 day adventure. One evening we slept high up on a rocky slope near the Orange River Gorge, it was magically I even left my tent open so I could see the mesmerizing twinkling stars. They appeared so abundant on the inky blackness like I could reach out and touch them we were so high up. Another evening we camped next to the cascading river. The soothing sound of the water tumbling over the rocks vibrated over the landscapes and lulled us to sleep. Another night we camped on a grassy slope next to a calmer section of the river. On that particular camp site we spent hours fishing which was tremendous fun! There isn’t one particular memory that stands out from the rest, or one that I can openly highlight from this whole experience. Each and every aspect of the orange river rafting adventure contributed to making this our most unforgettable vacation ever!!! A nice camp fire for the evening before sunset on the Orange River Expedition. Over the last few years we have had an awesome time on the river with your guests. The demand for Rafting with us have grown and we are loving it.. especially our Orange River rafting experience and our New Years Orange River rafting . We have facilitated a number of large corporate groups and school camps. The special treat is however the families and friends we host. This adventure is a life changing experience. The Orange River Gorge where we have 80% of our trips has the most spectacular and easy runnable white water section of the Orange River at the times of the year we operate. We raft downriver over several days. Our Camp sites along the river are as unique as the experience. The Orange River Gorge is a very remote destination and only accessible by foot or rafting – it is one of the most undisturbed sights you will ever witness. Once at the bottom of the Gorge we paddle a few meters up to where we see the Waterfall dropping into the Gorge itself before proceeding further. Its always easy to go on the river with any operator but we do believe that utilizing one of the most remote sections of the river adds to the whole experience. We do not take groups larger than 20 guests (unless it is a school or corporate group) We guarantee an unforgettable experience with a life time of memories. We also take loads of pictures and they are included in your rate. We have a number of options from transport included to budget rafting trips. Herewith is a few pictures of our last river rafting trips. White Water Rafting near Cape Town on the Palmiet River. Its been a wonderful White Water season on the Palmiet River near Kleinmond. The rain has once again transformed the Palmiet river (+- 50 minutes from Cape Town) into our best winter white water rafting product on offer. The fact that so many white water kayakers visit our Local Kleinmond Palmiet River every weekend is proof of the popularity of this river with in the White Water Kayaking community. The local Hermanus White Water Kayakers have had a blast on this river for the past 2 months. The rain is expected to provide us with one of the best White Water Rafting seasons this year. Our Cape Town visitors have enjoyed this extreme rafting adventure since its only a stone throw away and Clarence Drive from Gordons Bay, Pringle Bay to Bettys Bay is undoubtable one of the most scenic coastal roads in the World…. Max people 20, We use 2 man rafts called Croc’s, in High water we use 5 man rafts called a Nile. The scenery is breath-taking as the mountains tower over you, and the lush green nature reserve stretches as far as the eye can see. The smell of fynbos cloaks around the river, as insects buzz and sound of wildlife echo off the gorges. Tubing is provided during the summer months, while rafting is expected during winter. Professional guides lead you on this adventurous ride of a life time, but bookings are essential. Relax and for a few hours forget about the hustle and bustle of the city join us for white water rafting near cape town. We supply clients with 7mm Wet suites so you will be warm for the duration of the ratting experience. Once again we had a wonderful and near perfect Orange River Rafting expedition – Near perfect you ask? – we lost a bucket and luckily a small amount of food at the notorious Big Bunny rapid. Hosting and guiding the Graham family was an absolute treat and the 5 girls kept us entertained all the way on our Orange River Rafting expedition. The flow of the river was also extremely forgiving with hardly any paddling required and a number of nice (but safe) large rapids as we descended down river on our rafting expedition. This Full Moon expedition was in stark contrast to our normal star filled night sky. The Moon however illuminated the canyons and mountains and gave us a wonderful display in the night sky – its amazing how everything just seems to come alive at night. We also in addition to our normal rafting expeditions took some much needed time to sample the Orange River Water Quality – With a sample net in hand we collected Aquatic Invertebrates and with the help of Mark from Ground Truth and an illustrated guide book we started to identify the invertebrates – the more invertebrates are found in the sample the better the water quality – Very interesting!! Herewith is also a link to the website….. I cant wait to sample this section of the river again on our next visit. Our next expedition will be in November 2014 – contact us if you would like to join as we have limited space available. Part of our Orange River Rafting expedition travels through the spectacular Orange River Gorge. Most of the expedition is easy runnable white water s.
We run downriver over several days. Our Camp sites along the river are as unique as the experience. Join us now for an unforgettable experience. We still have a few spots (6) available for our April – Orange River Rafting Expedition. Here we will abseil or lower everything in to the Gorge +/- 50 meters down to the River below the Waterfall. It is therefore no surprise that our guides decided to run a section of the lower Orange River again this year with the intent on running small exclusive trips in the future. Day one consisted of a meet and greet at Onseepkans. Later that afternoon we started with our 5 day journey down a section of the Orange River “I would like to think this section has the best to offer – best scenery – best camping spots – unspoiled – remote – plenty of fishing spots – lots of wildlife activity (no other human contact once on the river) which is very important – a nice mix of flat and fast water to cater for every persons individual needs or experience. As the sun sets over the Orange River we find the most idyllic spot to camp for the first evening. The fish activity around us in the water was evident with the constant breaching and the last sun light catching the silhouettes of the fish as they pierce through the water. A nice camp fire for the evening before sunset on the Orange River 5 day Expedition. The Chefs / Guides grab the last bit of sun light to prep for dinner and over a nice cup of coffee we discuss the days experience and later our conversations wonder off to any and everything…. Needless to say after a good helping of dinner (a menu fit for a king) and plenty of conversation everyone sets off to their tents for the night. Our first easy 5 km paddle for the day was now a thing of the past and with much enthusiasm I was looking forward to the next section. The tone was set for what was to become for the guests as it had been for me on my first trip down this section of river – “Life Changing” and most importantly a tick off the bucket list. On day 3 we reached the Orange River Gorge – Probably the most spectacular spot and camp sight on the Orange River. The site overlooks the Gorge and with a drop of +- 60 Meters the water cuts the rock below the camping sight. One cannot help but wonder around with your jaw open as the water rushes trough the rocks from the top to the bottom of the Orange River Gorge. This has been a water vs rock battle long before the first humans walked the earth. The most amazing thing is that in the Gorge you feel like the only humans on earth. The Gorge is only accessible from the South African side by foot or raft and the site remains unspoiled. As the sun sets one can’t help but think that no photograph can justify the full contest of this unique life experience. Later that night after dinner we carefully descended into the Gorge in search of the Monster fish lurking below. That evening we caught a number of Barbel (Catfish) late into the night or early morning but the Monster Fish we searched for evaded us. That is till our next encounter of course. What we caught we released and I hope they don’t warn the Monster of our methods as next time he might not be so lucky. On day four we descended into the Orange River Gorge as our journey heads further down the Orange River. Just for one last brief moment we paddle up to the section where the water drops through the rocks into the Orange River Gorge. The deafening sound of the water makes this experience even more surreal as we take a last glimpse of the Gorge before we head to the largest of the rapids on this section of river. Big Bunny – and believe me – don’t let the name fool you – It ain’t no bunny!! – if you know what I mean. Here we take out just before the rapid and let the guides run the rapid and put up down stream and land based safety while the guests look on. Guests have an option to rather not attempt the rapid and have a gentle walk down stream to join the rafts. This rapid could have different problems at different levels and the guides instructions and decisions to run the rapid will be judged on an individual basis on each trip. The one 5 man raft with our clients on – on this occasion did run the rapid “Big Bunny” and had an absolute blast and an experience they will probably never forget. With all safely through Big Bunny we headed to our next some what less intimidating rapid on the Lower Orange River – Dolly Parton – the water runs through two very large boulders in this section and was very easily conquered. After a day of much adrenaline and excitement we pulled out to camp for our last night on the Orange River. This spot was ideal for some much needed fishing time and also ample time to explore the surrounding hills as the group split up to follow his/her passion – Explore or Fish? Life has such tough choices when you’re on the river. As the sun started to disappear behind the towering hills the smell of a real home made Spaghetti Bolognaise invaded the night sky. Soon everyone was around the fire place without even needing to call a single person to dinner. Dinner was held in silence (due to the good food) with only the sound of the rushing Orange River making its presence felt. Dessert was also on offer and after such a filling dinner the evening conversations, stories, myths and discussions started. The Night Sky was Incredible every evening, and in particular at this spot as our last evening camp. Some of us collected our sleeping bags from our tents and fell asleep outside as the stars put up an unforgettable display. The last day – Such a long awaited period happened from booking to starting the Orange River Rafting Trip that it was almost surreal that it will be concluded in less than 5 km of paddling. The five day rafting trip went by in a heart beat. The last days paddling created an image I will have forever printed in my mind. As we paddled over the length of the 5 days we spotted a number of animals, antelope, baboons and monkeys – the last day however we paddled near a large troop of baboons. The most amusing site occurred when we approached them down stream. They started to jump from a small island in the middle of the river into the water and swam to the other side. Some did this transition in style almost like a Michael Phelps whilst others jumped high in the air and landed in all strange positions in the water. Once they came up for air it was a race to the other side in order to evade us. We were in stitches and could barely paddle as most of our muscles where concentrating on our laughter. And to top this spectacle only a kilometer away fish eagles where circling above us. One person in the group still made a comment on how amazing it will be to see it catch a fish. The next minute without any warning a fish eagle flew only ten meters away with a large fish in its grasp – the fish still gasping for air and trying to break free from the Fish Eagles claws. What a way to end the Orange River Rafting trip. As I said in the beginning you haven’t rafted the Orange River if you haven’t done this section of the Lower Orange River with all of its diversities in beauty, animals, rapids, camp sites – the list is probably too long to continue – but I think you get the idea. Below are some more pictures we took on the Orange River Rafting trip. The Orange River Rafting trip is any professional or want be photographers dream. Most of the pictures below have been taken with a very inexpensive camera. This was our 3rd evening camp spot view! loved it!! From the coastal road along Gordons Bay, past Betty’s Bay you will reach the entrance to the Kogelberg World Heritage site on the left hand side – just before the Pamliet river bridge. Drive this gravel road into the reserve. Upon entering the reserve you will need to pay the Cape Nature entrance fee of R40 per person. From the parking area you need to follow the footpath “Palmiet” Along this path you will find the put in point clearly indicated with a Cape Nature sign. A bit of a walk later on this trail the fun begins – The Palmiet is probably the Western Cape River that is most forgiving if you havn’t kayaked for a while or starting to kayak. Some of the Rapids we love to run. Bubble and Squeak will be the first proper rapid you approach – the name at low level is evident as it hosts a nice boulder garden.lol At a higher level however this is an easy rapid. On a much lower level it almost seems like two different rapids but on a high level this rapid becomes double drop. The lines are easy to spot and this rapid should not be a problem at all. As you drive in on the dirt road you will find it hard not to spot Waterfall rapid on the right hand. Running this rapid is also a lot of fun and you can pull out before the rapid on the river right to scout your line before you continue. Crocs run this rapid on the far left (river left) flow. Kayaks can run this rapid as the water level dictates – always nice to run “Waterfall” straight of the nose . If the levels of the water allow we use the larger rafts for clients comfort. “not a nice swim” on high levels this rapid starting form the weir is more challenging than most of the rapids on the Palmiet and it isn’t called Judgment day for nothing. A small weir is situated just below the bend of the first large weir. You might only notice this at a medium level or lower. This weir has a lower section to the right where you can pass if the levels are low. ( This will ensure you don’t scratch your kayak more than necessary as the gap to the right is just perfect.) Just after the small weir is a nice eddy to chill in before you descend any further. The best line I have found from here is river left – hit the white water full on and stay on the river left till close to the end. The last stretch of the rapid will push you through the” Hells Gates” rocks – at low level its best to hit the middle of the gates (two boulders at the bottom of the rapid) at high levels you won’t notice the gates at all LOL. Take out on the Palmiet is just below the bridge to the right – if you take out to the right after the bridge you need to cross the busy road – be aware of oncoming traffic as this road is dangerous. If you take out before the bridge to the left you can walk up a nice short path past the municipal toilets to the gravel parking area. www.saforestadventures.co.za for more details on the river. Do You Need A Lift??? In winter this is one of the Western Cape White Water Rivers you must go and paddle. The Water levels may pick up and drop within hours of receiving rain so its always advisable to check a number of factors such as rain during the last 24 hours as well as the weather for the day you plan on kayaking. From Cape Town the put in point for the Molenaars River is just over one hour away. The easy accessible kayaking put-in point for the Molenaars river will be from the Cape Nature entrance (also a nice Fly Fishing spot) along the N1. Just after the N1 Tunnel. Walk down to the bridge and put in just below the small bridge on the river right. Low level on this river doesn’t pose much of a challenge apart from the boulders and rocks but as the levels rise you might find a number of strainers and the eddies will become smaller and smaller. The Molenaars river has the potential to be BIG WHITE WATER. So also check with the Du Toit’s Kloof Lodge (023 349 1151) on the levels of the water. The Rapid directly in front of the hotel is also called “Hotel Rapid” Pictures on this rock can be found on the Rivers and Kayak section of this site. We kayaked the Molenaars river on a low level as you can see by the video clip – but its always best to have a look at the river you intend on paddling during High Water while its still easy to run – in order to familiarize your self with a number of issues especially if you’re a novice. In an emergency the river luckily has a number of sections along the N1 and the N1 should be easily accessible from most points of the river.